E-Commerce is on the move. In the fast-changing landscape of E-commerce, there’s a need to take quick decisions based on the data you have. Marketing in E-commerce is heavily based on data and analytics. As a wise man once stated, “ Without data it’s just an opinion”. Marketing by guessing, you know, is supremely dicey. But, marketing backed by data is a sure shot win. With an excruciating growth in marketing platforms, it’s tough to track all the business-critical metrics and then derive insights from it. Understanding and unleashing the potential of E-commerce Analytics and making conclusive fixes take considerable number of man hours, especially, when an ecommerce website starts having sessions in upwards of 5-10k every day. As per the famous 80:20 rule, we need to see 20% of those metrics, which can give us 80% picture of performance. But what if you’re not able to fully capitalize on 20% of those metrics due to haywired reporting from your marketing team due to high volumes of data? Here are three quick fix dashboards. These dashboards will help you arrive at valuable insights faster than ever before. By just looking at these imperative dashboards, CMOs can easily drive sales, create their niche audience and implement action plans to create repeat buyers. Every effort that we put in daily across verticals is to keep the business flourishing. The overview on what is going on with the Business is a must- have to know what your present standing is, so as to decide the plan of action . We must be looking at all key metrics from where we can have an indication of which Piece/Vertical needs to be checked and dug deeper, also restricting the elements of report/dashboard to make it consumable. To have a clear understanding, let’s take a look how easy it is to identify critical areas by just viewing at the sample dashboard powered by EasyInsights. WHAT ALL WOULD IT ANSWER? How many orders I had yesterday? What was Domestic vs International Split? How many Acquisitions were made yesterday? Is Website Funnel working fine? How many cancellations were there? Is abandoned cart increasing? And many more other relevant questions bothering your business. HOW OFTEN SHOULD I LOOK AT IT? 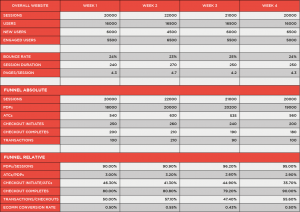 CMOs should view this dashboard daily as it is blueprint of business. This is where he/she can understand where his/her business stands as of today by just taking a glance. Once he/she knows his data, he/she can mould his marketing strategies and take data driven decisions for the growth of the company. A consolidated version can also serve as an instant fix for Investor queries. If you’d like us to generate valuable insights for your company (Just as we did for all these companies), then claim a FREE DEMO from us and get all your questions answered. What fuel is to cars, website analytics is to E-commerce. Thus, keeping a track of website performance should be on top of your must-see list. Measure your percentage of traffic from social, referral, direct and paid channels as it can be your most valuable source of conversions. Any drop off after any funnel event. If you are not getting sufficient number of new users. Are people visiting ample number of pages? Is average session duration as expected? Is checkout process working fine? Is there a technical issue on the website at any funnel step? Are users spending less time on the website? Can product width be an issue? Is ecomm conversion rate on the website improving with time? CMOs: Ideally, a deviation on daily basis should be ignored. Preferred to look at weekly level. Monthly level would come in handy for comparison purposes. If you’d like us to look at your website for your free performance audit, Get in Touch with us and book a FREE DEMO right away. CMOs are vested with the duty of growing the business with their marketing acumen and expertise. All their efforts are directed towards improving one crucial factor, which is, ROI. As a marketer in the space of digital advertising, it is essential to keep clear KPIs to drive efficiency, effectiveness and ROI for every penny spent. By analyzing all the key metrics related to your paid advertising efforts you can drive transparency, speed, and growth in your marketing. Take a look at how you can track these metrics in a single dashboard with the help of our product, EasyInsights. Which Channel/Campaign/Asset is helping me achieve better ROIs? Which Asset is giving me New Acq at lower cost? If new Inventory ads are working or not. If audience that we assumed should work, working or not? Is my new cluster of keywords working? CMO’s should definitely have look at it at least once in day as it’s a question of ROI. 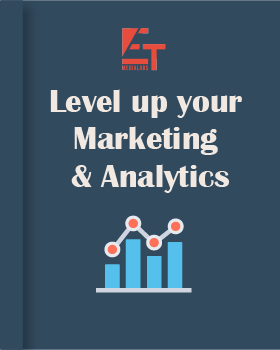 Marketing managers should make it a point to monitor it from time to time in a day as huge fluctuations can lead to significant impact on revenue. Easy Insights gives in-depth analytics and answers to questions that otherwise seem too abstract to be answered, using strong mathematical correlations and proprietary algorithms. The Dashboards listed above can be powered using EasyInsights.ai in a couple of days. Want to check how it works? Book a Demo.